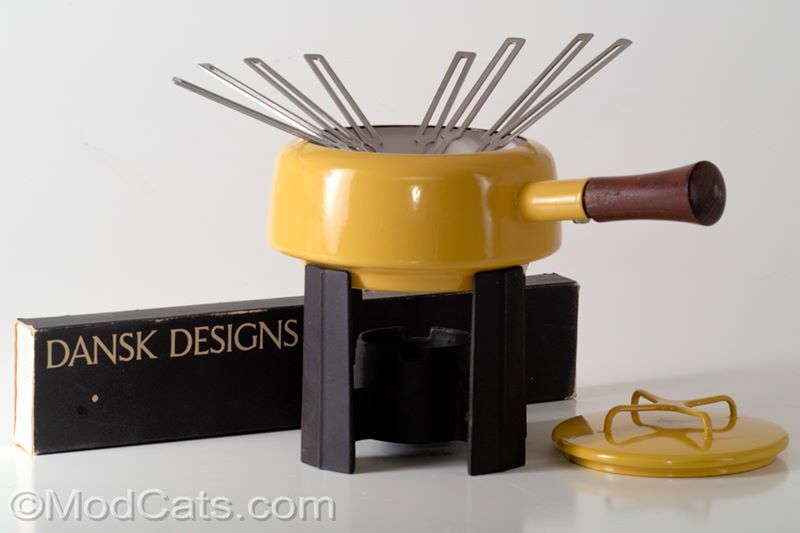 Jens Quistgaard (1919-2008) for Dansk (Denmark) Kobenstyle fondue set. Yellow enameled cast iron pan with teak handle and heavy cast iron base (missing air damper - but will work with sterno candles etc.). Comes with two sets of four (8 total) Jens Quisgaard (IHQ) designed stainless steel fondue forks in a single box with original instructions. All items manufactured in France. Dimensions: 6.5-ins diameter pan - 9-ins tall. Forks are 10-ins long.